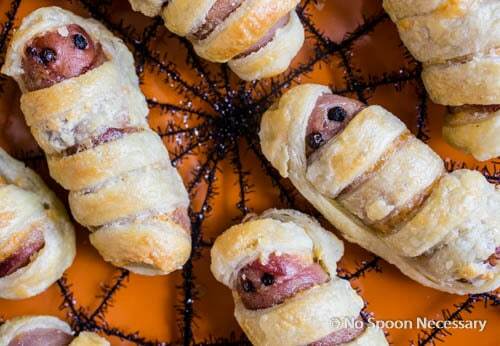 These Mumm-eenies are festive, fun and the perfect delicious treat for Halloween! 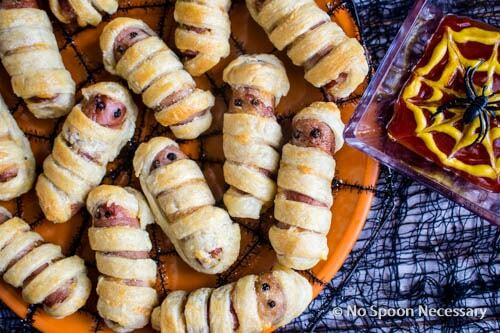 Hotdogs wrapped in bacon and cheese and puff pastry to form little hot dog mummies! 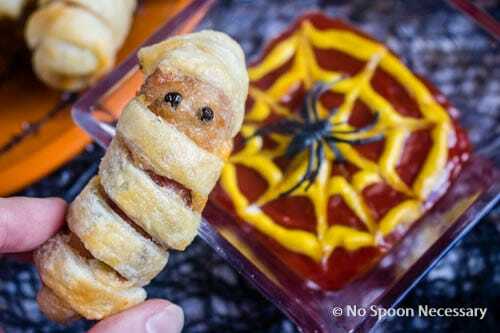 Serve it with ketchup and use the mustard to form a decorative spiderweb on top for the ultimate spooky treat! Ah, Halloween. Jack-o-lanterns, creepy crawlers and things that go bump in the night. Candy corn, chocolates and sweet treats – oh my! Halloween is such a fun holiday. Children all decked out in their “scariest” (downright adorable) costumes, carting a candy bag bigger than their head and knocking on your door shouting “Trick or Treat!”, with such enthusiasm you can’t help but smile… and laugh a little. I love Halloween. I look forward to getting my girls dressed to their scariest nines, handing out candy to the neighbors, decorating our entry way with cobwebs and spiders, carving pumpkins and especially making “spooky” treats. Mostly the treats are just for boy to bring to work, but any excuse to get in the kitchen and I’m all over it. This is the first holiday post for NSN. The post being for Halloween, I wanted to do something kid friendly. To be honest, making kid food is out of my comfort zone, considering my children walk on four legs, have tails and are covered in fur. And that is not just for Halloween. That’s permanently. So “kiddie” type food obviously isn’t my specialty, unless it contains peanut butter or chicken-rice and comes shaped as a bone or served in a bowl on the floor. I do have a wonderful nephew and a fabulous niece, so I know what my two little buggers like… McDonalds for him, chocy (chocolate) milk and pretty much everything for her (doesn’t even have to be edible lol). Since I didn’t want to make pumpkin shaped nuggets, I decided to use my niece as my culinary muse. She will eat hotdogs straight from the bag, which is a little odd, but it is one of her adorable quirks, so I knew I wanted hotdogs to be my main ingredient. 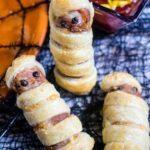 While perusing www dot com land, I found these hotdog mummies all over Pinterest. They were cute, but everyone was using crescent rolls and no one was including bacon or cheese. WHAAA? No bacon AND no cheese??? No, no, no, no! Culinary blasphemy people! 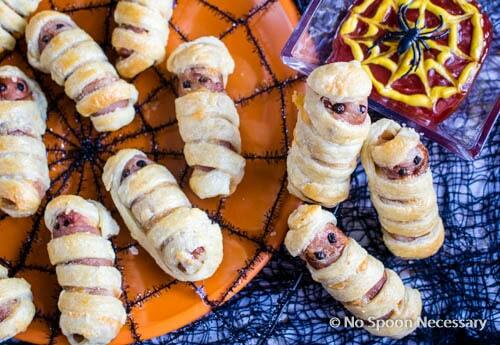 We are putting a stop to this right now with my version of hotdog mummies – Mumm-eenies. 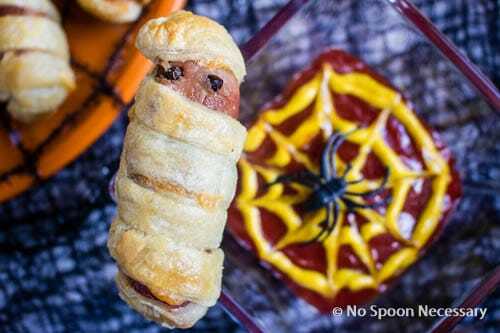 Frank’s wrapped in bacon and shredded cheese covered puff pastry with a ketchup and mustard spider web dipping sauce. 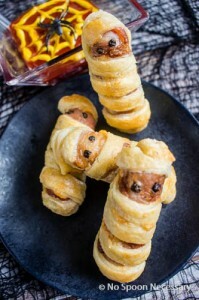 Add these to your Halloween party menu, feed ‘em to your youngsters before they head out to trick or treat, or simply make them for your big little kid at heart. 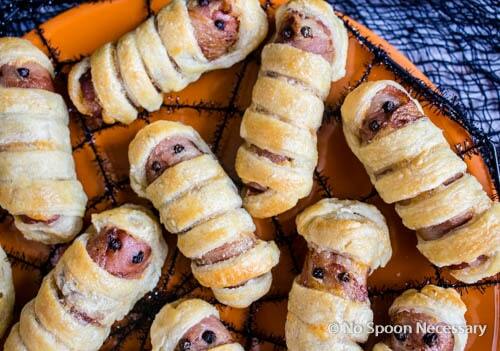 But don’t go anywhere, I have another spook-tac-u-lar recipe coming up for you… so stay tuned! Preheat the oven to 400 degrees F. Line a baking sheet with parchment paper, set aside. Crack the egg into a small mixing bowl and whisk with water to create an egg wash. Set aside. Wrap each hot dog with one slice of bacon. Secure bacon to both ends of the hot dog with a toothpick half. Place a large sauté pan over medium-high heat. Cook the bacon wrapped hot dogs, in batches so you do not overcrowd the pan, using tongs to roll, until bacon is crispy all over, about 4-5 minutes. Remove hot dogs from pan and transfer to a wire rack inserted over a sheet pan. Set aside until cool enough to handle. Remove toothpicks and discard. Unfold the pastry sheet on a large piece of parchment paper and lightly flour surface. Sprinkle cheese all over the top of puff pastry. Top with another piece of parchment paper. Use a rolling pin to press the cheese into the puff pastry. Cut the pastry sheet into 16 strips, about 1/2-inch wide each. 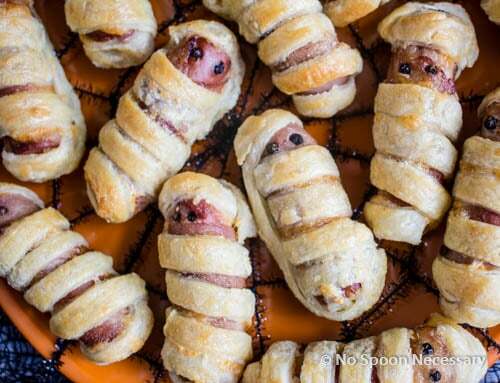 Wrap a pastry strips around each of the hotdogs, leaving a space at the top for the mummy’s face and press to seal. Place the pastries onto prepared baking sheet. Brush the pastries with the egg mixture. Bake for 15-20 minutes or until the pastries are golden brown. Let mummy dogs cool on pan for 2-3 minutes. Remove the pastries from the baking sheet and let cool on a wire rack for 10 minutes. 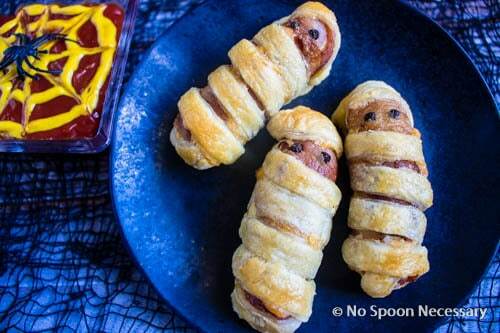 Decorate Mummies with ‘eyes’ using ketchup, mustard, peppercorn seeds or mustard seeds. Serve the pastries with the mustard, mayonnaise and/or ketchup for dipping. 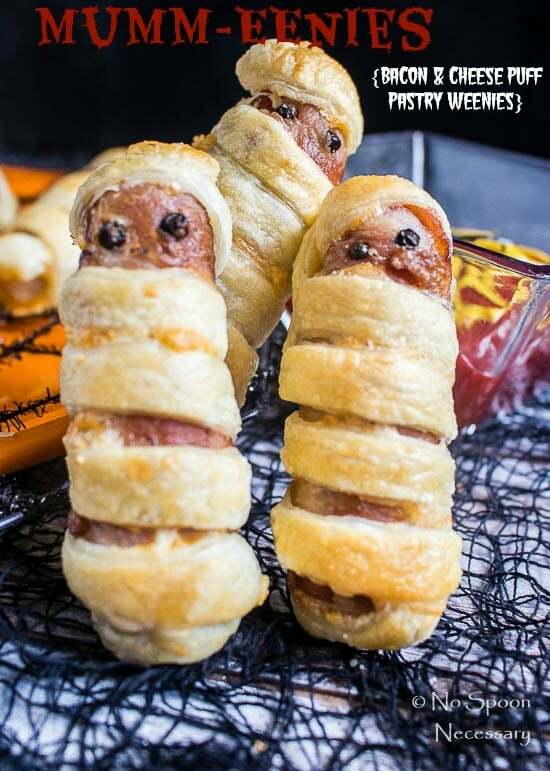 *To make full size mummies: keep hotdogs whole, use two strands of puff pastry for wrapping and continue as instructed above. *To Reheat: Preheat oven to 325 degrees and bake for 7-10 minutes or until desired warmth if achieved. 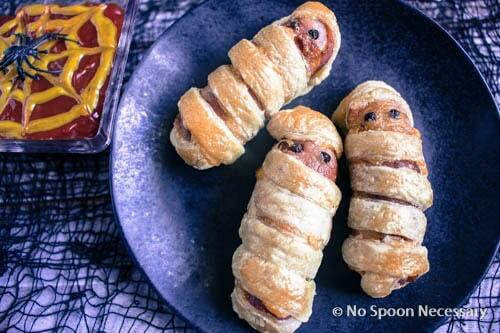 I love these mummies….especially with the spider web ketchup!